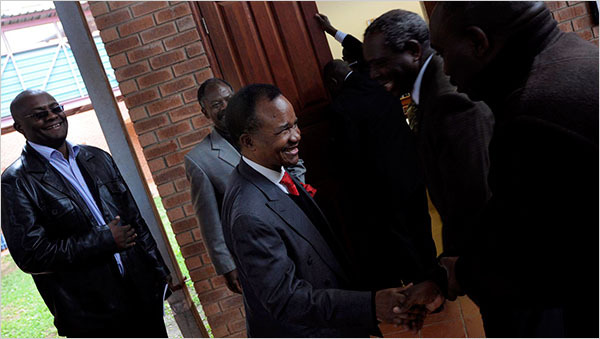 Chiluba’s lawyers have employed all tactics to drag and delay the verdict.Levy who initiated this case has not lived to see the how the wheels of justice has finally halt. But it is not for Levy to see that justice prevails. it is the Right of many Poor citizens who call this country their Home. If anything Levy also help to slow the dispensation of justice in Chiluba’s case,involving Katanga Gorvernor and Chani Fisheries Tamba Abashila proprietor Moses Katumbi, who was later had all chargers scraped in the name of National unity and seeing the firing of Vj Mwaanbga by Levy.There is still unsolved justice on that matter. That is the common nature and problem of Zambians they have more personal problems to worry about than those of public interest. Maybe the post can re-run the article about the charges that were slapped again Chiluba to refresh our minds and moods. Mind you Chiluba is not standing trial in Supreme court , which means if convicted he can still appeal and stand on bail for the next 10 years.Only in Zambia. With this kind of Judicial systerm, Zambians must be vigrant and make sure that the Government is doing the right thing and not to wait for the President to leave office before you start saying infwe infwe. The current president RB Bwezani has seen more people die from the striking health workers than than past three resumes part together that is why his government bought 100 H3 Hammer hearses to Luxuriously bury you on an empty stomach. Chiluba’s Verdict will has been a joke I hope it does not come out like Dora. No case to answer if it turns out to be like that release all prisoners,,,I will either believe there is no law or there are no criminals in Zambia. I am watching this space. Whatever goes round comes back, and whatever a man plants thts which he shall reap. Let Chiluba stand trial and if it means he been imprisoned let that be so that these are public and private civil servants learn a lesson. As a Zambian in South africa i await the final verdict and this must be a positive one! i agree with wesa. I only say longer. I dont care if he gets the chair or life. He has killed many, he has robbed many. I say life. If i went n stole a car from the streets of lsk, i will have it rough. He is zambian and he is a criminal. He should be sorted as an ordinary citizen. if and when chiluba is found guilty i strongly believe he will not spend it behind bars. but his case should be a deterant for future leaders. we in africa have come a long way in terms of democracy and i would not want us to slide backwards. the thing is i fear future leadrs will not relinquish power for fear of being persecuted after their tenure in office. i believe that the only way of beating corruption in goverment is by giving the power back to the people. the office of the president holds too much power. the president needs to be answerable to some authority appointed by parliment. Finally the thief will be punished, he kicked my father and our family out of Zambia for trying to expose his ugly skeleton when he was in power, I pray that he rots in his cell, he must be brought to justice. Not just for a little while, he is on trial for a crime that does not compare to the evils he has committed during his reign, cage him for life!! Personally as a human being i have nothing against Chiluba But as a Political leader who once promised us change.. You certainly brought change. Stealing,Corruption Killing.. They should lock you away and throw away the key, some how even that seems too good for you! I’m contemplating launching a campaign for charges to be dropped on FTJ, not that I am/was his supporter but just that it’s been a circus and waste of national resources. Your thoughts! … I am equally disgusted about, but I think the premise is what is right and just. Justice is far much higher than friendships and feelings. We serve a just God, and He’s a God of Justice. The late President Levy P Mwanawasa, SC (MYHRIP) understood this premise perfectly well mainly due to his profession as an attorney, I think. Levy was one of the few in billions (who reside on this earth) to have such moral clarity on this. My advise to you is let justice prevail, I would not have advised you this way if you did not ask, though. Where there’s justice, real love, real friendships and moral feelings thrive … thanks a trillion. well its good to see that they are making some sort of head way in the matter but the question that has to be asked is at what cost? how much has it cost the tax payers for the so called task force to get this far? and if the courts don’t find him with a case to answer to what would have been the cost on the task payer?what would that me to the money that we are given no account of that the so called task force is spending? As tax payers we have a big right to know these things. Mulingile muba kake Ba chiluba.All the time i watch his video i cry,he promised so many things that he never accomplished.He also declared ZAMBIA as a christian nation,he was only hiding in the bible when he is a THIEF himself.Shame short,you need to be arrested.You spent on the money on face products and Luxury things when us the people of Zambia remained starving and suffering.You need to be CRUCIFIED! let him knw that what he did was bad,people suffer bt he did not think of the poor Zambians.pls deliver us so that people can lean,wsh him the best.concerned Zambian.